Biossance Cleansing Cloth Review - What Is It & How Does It Work? 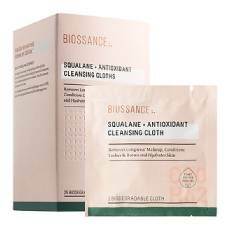 Biossance Cleansing Cloth Review – What Is It & How Does It Work? Biossance Cleansing Cloth is a product that is used to remove the longwear makeup for a clean skin. It is responsible in cleanses as well as removing makeup effectively and gently without having to dry your skin. It is known to nourish your skin to make sure that you keep a healthy and better looking skin. It provides antioxidants to your skin to help in protecting it for you to achieve a healthy and improved skin’s look. It is meant to leave your skin feeling exceptionally comfortable and smooth. It is known to have been formulated using biodegradable cloths that clean your skin. It is a product that is purchased through online and it is known to be priced at $18.00 only. What are Biossance Cleansing Cloth Claims? This is a product that is known to have been formulated without mineral oil, phthalates, parabens or synthetic fragrances making it a quality and safe product for your own use. It is claimed that the product has been tested by dermatologist, ophthalmologist tested and does not clog your pores when you use it. It is known to utilize powerful and trustworthy ingredients which are effective and help the product deliver desired results. The outer packaging of the product has been made through use of sugarcane paper. Biossance Cleansing Cloth Review: How Biossance Cleansing Cloth Works? The product is known to work perfectly through removing your makeup as well as conditioning your eye lashes and brows. It is known to work well with dull, uneven and dry skin for desired results. Its mega-moisturizing molecules are known to hydrate your skin as well as locking required amount of moisture into your skin for supple and soft skin. It also gives your skin the nourishment it requires for an improved skin’s look. Squalane – It is a mega-moisturizing molecule which is known to hydrate your skin as well as locking the desired amount of moisture into your skin for supple and soft looking skin. Olive oil – It has been extracted from olea europaea and it is used to provide your skin with antioxidants. It also helps in delivering hydration due to the contents of fatty acids. Jojoba seed oil – It has antibacterial properties which eases irritation and inflammation on your skin. It also has healing properties for treating bruises, acnes, sunburns and dryness. Rosemary leaf extract – It eases your skin on cellular level through protecting the skin cells from being damaged by sun’s rays or free radicals. Sunflower seed oil – It has fatty acids like linoleic, palmitic and oleic as well as having vitamin E to eliminate symptoms of aging. It leaves your skin hydrated and plump. Rice bran extract – It increases hydration as well as removing signs of aging. It ensures that your skin remains firmer through utilizing its vitamins and fatty acids. It is safe product for your own use. It combats aging signs for a smooth and youthful look. It provides healing properties for bruises and injured skin. It offers antioxidants and antibacterial properties for improved skin’s look. You are required to wipe the cloth across your lashes and brows. You can also wipe across your face to eliminate toxins, leftover makeup and bacteria. This will help you condition the area of your skin that is covered by makeup as well as ensuring that your skin is left feeling healthy and smooth. The product causes no side effects on you when you use it. Biossance Cleansing Cloth is a product that is used to eliminate the toxins, leftover makeup or bacteria on skin for a clean skin. It is known to be effective and gentle on your skin without having to make your skin dry. It is meant to nourish your skin for healthy and better looking skin. It provides healing and antioxidants properties to protect your skin and treat bruises or injuries. It promotes increased hydration to your skin to help in combating aging signs so that you can realize a smooth and youthful skin. It protects your skin from being damaged by free radicals and sun burns so that you keep a better looking skin. However, if you wish to try this product due to the advantages above, then you should investigate more on its ingredients. This is a crucial step that will help you find out any potential side effects linked to the ingredients. Therefore, you will be able to make prudent decision whether the product is suitable for your own use or not.